Before you can process credit cards for a customer, you need to configure your customers. We are going to look at the credit card specific setups for an already existing customer. Any customer can pay via credit card at the time of order entry. However, you can also configure a customer to use credit cards as their default payment method. To do this, navigate to the customer card and scroll to the “Payments” fast tab. On the right of the tab, you see “Show more”, which will display additional fields when clicked. Once you selected “Show more”, the field “Payment Method Code” will be available. If this customer should pay via credit card by default, select the credit card payment method in this field. If a payment method code is selected that has the “Payment Type” set to “Credit Card”, each order requires a credit card to be selected or entered, before the order can be posted. If the customer wants to pay a specific order via check or cash, you can change the “Payment Method Code” on the individual document. We are suggesting that you also validate that the “Payment Terms Code” on the customer is set to a term such as “Cash on Delivery” or “Credit Card”, since you would not want to setup payment discounts for customers when they pay via credit card. Some customers might not want to give you the credit card information over the phone or email. You can allow those customers to enter their credit card information themselves, without having to provide you with the details. They can also pay their invoices via credit card after the invoices are sent to the customers. This is done using a payment service. You can learn more here about setting up a payment service for credit card payments. If you have an email address defined on the customer card, you can send the customer a sign up email to allow the customer to register with the EBizCharge Connect payment portal. A customer can log on to the portal and enter their credit card information securely on the site. 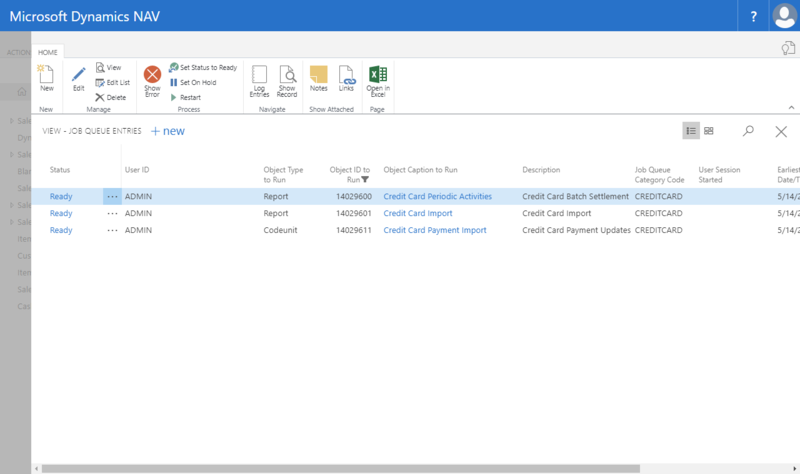 Microsoft Dynamics 365 Business Central then downloads this information from the portal in a tokenized form so that you can use the credit cards to charge orders or invoices, but the customer does not have to email you their information or give them to you via the phone. The customer will be setup in the portal and an email will be sent to the customer allowing the customer to register at the portal. The customer will need to enter the email address as well as their zip code. Once logged on to the portal, different payment methods can be created. Business Central has an scheduled job running (by default every 60 minutes) to import newly entered credit cards into the system. Once they imported, you can use these cards to authorize and charge orders against. The email sent to the customer is a word document and can be customized. The default layout is shown below. Another option is to define a Payment Service for a customer. You can do that through “Change Default Payment Service” in the action ribbon. The currently selected payment service is shown in the “Default Payment Service” under “Payments”. A payment service allows you to add a link to all invoices that will bring the customer to a payment form. The payment form then allows the customer to enter their credit card information and pay the specific invoice. 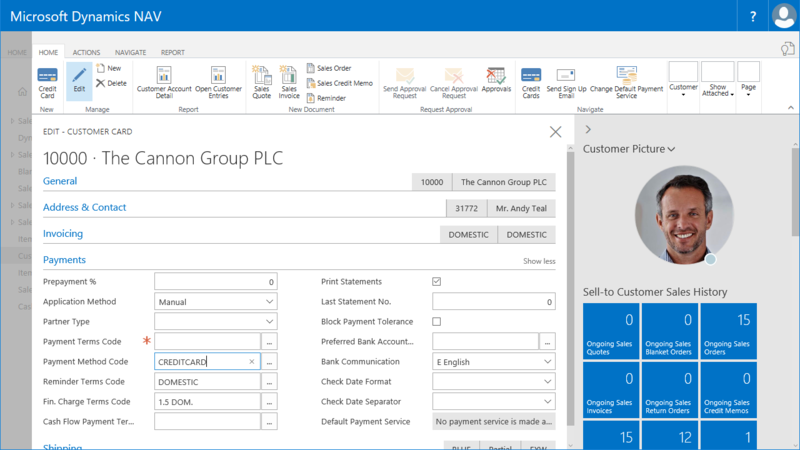 If a customer wants to pay multiple invoices at the same time, they can do so via the customer portal described above. Please go to Payment Services Setup to configure a payment service properly for this. It is important that the “Application Method” for the customer is set to “Manual” for any customer that should be able to pay via credit card. This setting is the default for a customer. You can define credit cards for customers to keep these on file and then be able to use those during order processing to charge the required amounts against the saved credit cards. Please go here to learn how to enter new credit cards for customers.